The U.S. economy isn’t exactly booming. While the unemployment rate has fallen to its lowest level since 2007, the economy is still growing at a relatively slow pace. Some places, however, are better off than others. For the third year in a row, SmartAsset took a look at the places experiencing rapid population and economic growth. Read on to find out which cities rank at the top of our list. This is SmartAsset’s third annual study of the top 10 boomtowns. Read the 2015 analysis. 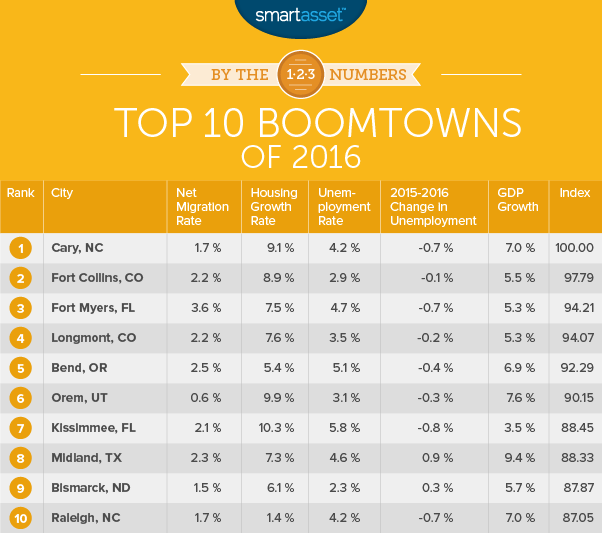 To find the top 10 boomtowns of 2016 we ranked 572 of the largest U.S. cities. We used five different metrics, including the unemployment rate, the GDP growth rate and the net migration rate (the difference between the rate of residents moving in and the rate of residents moving out of a city). We also looked at the housing growth rate and the annual change in the unemployment rate in each city. You’ll find our full methodology below. Oil towns no longer dominate this list. As oil prices have plummeted, many oil towns that were once economic strongholds are struggling to stay afloat. But in cities like Midland, Texas and Bismarck, North Dakota our data indicates that the tide may be turning. Economies are growing on the East Coast. For the first time since we started ranking the top boomtowns in America, four cities that border the Atlantic have made it into the top 10. Following the oil bust, cities in states like North Carolina and Florida have some of the fastest-growing economies in the country. Cary is one of the largest municipalities in the state of North Carolina. It’s part of the Raleigh-Cary metro area, which has more than 1.2 million residents. A number of universities surround the region, including the University of North Carolina at Chapel Hill and Duke University. That’s why Cary – along with Raleigh, Durham and Chapel Hill – is part of an area known as the Research Triangle. While it’s smaller than most of its neighbors, Cary is becoming a force to be reckoned with. Its housing growth rate of 9.1% is among the highest rates in our analysis. For years, the presence of strong research institutions has drawn tech companies and entrepreneurs to the region. Many major metro areas in Colorado have seen job growth slow within the past year. But the Fort Collins metro area is still going strong. In August 2016, the city’s unemployment rate fell to 2.9%, which was far below the national average. In addition to watching its economy grow, Northern Colorado has seen its population boom in recent years. In fact, the Fort Collins metro area has become one of the fastest-growing metro areas in the nation, thanks in part to its investment in energy and economic development. Local housing markets have experienced stable growth and the number of housing units in Fort Collins grew by 8.9% between 2014 and 2015.
living in the Cape Coral-Fort Myers metro area. More millennials and baby boomers are expected to move into Fort Myers in the near future. To make room for transplants who want a convenient, big-city lifestyle, developers are sinking millions of dollars into the construction of new shops, nightclubs and condos downtown. The city of Longmont is located about 38 miles from Denver. In August, its unemployment rate was only 3.5% and job growth in the area has been steady since the beginning of 2016. Longmont’s economy is anchored by four main industries, including the creative arts and culinary industry and the bioscience industry. It has also found some middle ground between providing opportunities for manufacturing workers and supporting employees in the tech industry. 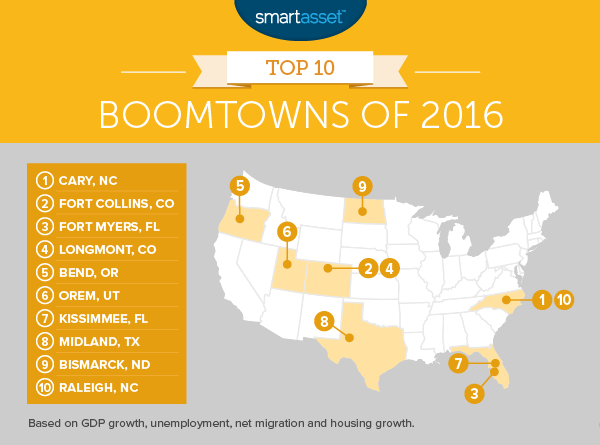 Bend ranked fourth in the 2015 edition of our analysis of the top 10 boomtowns in America. While it has fallen in our ranking since last year, unemployment is down and its GDP growth rate has risen to 6.9%. There are several reasons why Bend’s economy is growing. For one thing, the city continues to bring in a constant stream of tourists eager to explore the area and participate in a wide variety of outdoor activities. The city’s low cost of living has also led people to want to move to Bend, Oregon. Orem has finally managed to rebound from the Great Recession. It has been a leader in economic development for decades and in recent years, construction activity in the city has surged. Between 2014 and 2015, the number of housing units in Orem increased by nearly 10%. The city has also upgraded many of its buildings and added new offices and retail space. These redevelopment and construction projects have created new jobs in Orem and given the economy a big boost. Kissimmee is part of the Orlando metro area and it’s one of several Florida cities that’s experiencing significant economic growth. Among the cities that rank in the top 25, Kissimmee, Florida has the highest housing growth rate. The number of housing units created in the city within a single year grew by 10.3%. Out of the 572 cities in our study, Midland has the highest GDP growth rate: 9.4%. Major oil companies in the area are beginning to expand and there are more than 100 active oil rigs in the Permian Basin, which stretches across West Texas and southeastern New Mexico. While many people are still trying to get back on their feet, Midland’s economy is very much alive. Bismarck is another oil hub that’s showing signs of life. While the unemployment rate has risen slightly in the past year, only 2.3% of people who were actively looking for work in August remained jobless. The economy in North Dakota’s capital isn’t growing nearly as quickly as it was before the oil bust. But compared to cities like Fargo, our data suggests that Bismarck is in a better position to bounce back. The City of Oaks belongs on this list for a couple of different reasons. At 7%, GDP growth in the Raleigh metro area is among the highest growth rates in the nation. And as of August 2016, Raleigh’s unemployment rate of 4.2% was relatively low compared to the national and statewide unemployment rates. Net migration rate. This is the number of people who have immigrated to a particular city minus the number of people who have emigrated from that city between July 1, 2014 and July 1, 2015, as a percentage of the city’s total population. The net migration rate looks at all population growth that isn’t related to births or deaths. Housing growth rate. This is the percent change in the number of housing units between 2014 and 2015. Unemployment rate. This is the number of jobless individuals who were actively looking for work in August 2016, as a percentage of the total labor force. Annual change in the unemployment rate. This is based on preliminary labor force data from the period ranging from August 2015 to August 2016. GDP growth rate. This is the yearly growth in total output for the period ranging from 2010 to 2015. We took each metric and calculated a score based on the number of standard deviations above or below the mean each city rated. Then we added up our scores, giving half-weight to the unemployment rate and the annual change in the unemployment rate, and full weight to the other three factors. We took our standard deviation total and re-ranked each city. The city with the highest total scored a 100 and the city with the lowest total scored a 0. GDP growth rates come from the U.S. Bureau of Economic Analysis. Unemployment rates come from the Bureau of Labor Statistics. Net migration rates and housing growth rates come from the U.S. Census Bureau.